KRAKYLIEN ICHI MYRRLISCHAU !! UUUUUUUUZ MONDORRF MIT DE SCHTAU PO SCHTAU. YYYYYYYYYYYYYYYYYYYH !!! Ikscheltaschel was formed by the two cousins, Kresten Osgood and Søren Kjærgaard sometime back in childhood in the 80’s. It was a humouristic approach to languague, sound and movement, a kind of self-invented vocabulary that would change according to voice-pitch, body languague etc. After the two cousins both moved to Copenhagen to start at the Rhythmic Music Conservatory on respectively drums and piano, the Ikscheltaschel-thing spontaneously happened during a performance with Kresten Osgood’s Hvad Er Klokken one night at Studenterhuset in 1999. (The incident was actually recorded and released on Osgood’s debut with Hvad Er Klokken). The following year Osgood and Kjærgaard joined forces with Jens Jenno Bjørnkjær and started working on the first Ikscheltaschel album, where the imaginary babble-languagues were set in a hip hopish frame. Soon after the release of the Ikscheltaschel debut in 2001, the band became a cult in Copenhagen playing sold out shows. 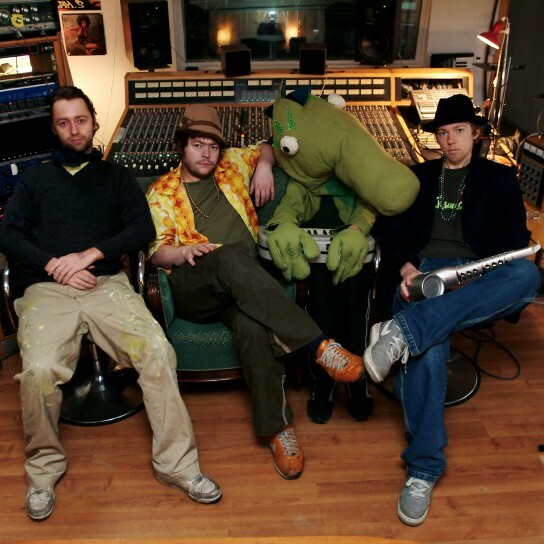 After the release of their second album, Ikscheltaschel 2, in september 2004 the band experienced a comet-like rising from the underground of Copenhagen to national recognition with the hit-single “Putuni” and the prestigious Danish Radio P3 Gold nomination. The high point, so to speak, was when Ikscheltaschel opened the Roskilde Festival in 2005 on the legendary Orange Stage in front of 35.000 people, with 41 musicians, dancers and performers on the stage.